Scott Olsen, a 24-year-old former U.S. Marine who served two tours in the Iraq war, was critically wounded after being shot in the head by a police projectile at Occupy Oakland. In a rare interview, Olsen joins us to discuss his life-threatening ordeal, his involvement in this year’s historic Wisconsin and Occupy protests, the case of accused Army whistleblower Bradley Manning and how he too had access to similar types of information, and the U.S. withdrawal from Iraq. “They aren’t respecting our right to assemble, protest and redress our government for grievances,” Olsen says of police repression of the Occupy protests. “They are terrorizing us from going out [to demonstrations]. That is a sad statement for our country.” Olsen also says he expects to rejoin the Occupy and antiwar protests as his recovery progresses. “I look forward to being a part of the 99 percent and Iraq Veterans Against the War in 2012,” he says. Scott Olsen gives his first interview since being injured with a Police projectile during an Occupy Oakland event. The interview reveals the tragic effects of his injury, but we are all thankful that he survived and is recovering. A second Iraq war veteran has suffered serious injuries after clashes between police and Occupy movement protesters in Oakland. Kayvan Sabehgi, who served in Iraq and Afghanistan, is in intensive care with a lacerated spleen. He says he was beaten by police close to theOccupy Oakland camp, but despite suffering agonising pain, did not reach hospital until 18 hours later. Sabehgi, 32, is the second Iraq war veteran to be hospitalised following involvement in Oakland protests. Another protester, Scott Olsen, suffered a fractured skull on 25 October. 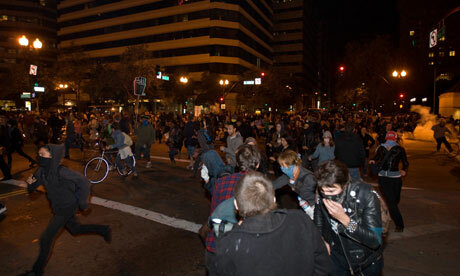 On Wednesday night, police used teargas and non-lethal projectiles to drive back protesters following an attempt by the Occupy supporters to shut down the city of Oakland. Sabehgi told the Guardian from hospital he was walking alone along 14th Street in central Oakland – away from the main area of clashes – when he was injured. “There was a group of police in front of me,” he told the Guardian from his hospital bed. “They told me to move, but I was like: ‘Move to where?’ There was nowhere to move. Sabeghi, who left the army in 2007 and now part-owns a small bar-restaurant in El Cerrito, about 10 miles north of Oakland, said he was handcuffed and placed in a police van for three hours before being taken to jail. By the time he got there he was in “unbelievable pain”. He said: “My stomach was really hurting, and it got worse to the point where I couldn’t stand up. A nurse was called and recommended Sabehgi take a suppository, but he said he “didn’t want to take it”. He was allowed to “crawl” to another cell to use the toilet, but said it was clogged. Sabehgi’s bail was posted in the mid-afternoon, but he said he was unable to leave his cell because of the pain. The cell door was closed, and he remained on the floor until 6pm, when an ambulance was called. He was taken to Highland hospital – the same hospital where Olsen was originally taken after being hit in the head by a projectile apparently fired by police. Sabehgi was due to undergo surgery on Friday afternoon to repair his spleen, which would involve using a clot or patch to prevent internal bleeding. Thousands of protesters had attended the action in Oakland on Wednesday, taking over the downtown area of the city and blockading Oakland’s port. As demonstrations continued near the camp base at Frank H Ogawa plaza during the evening, a group of protesters occupied a disused building on 16th Street at around 10.30pm, with some climbing up onto the roof. There had been little police presence during the day, but more than 200 officers arrived after 11pm. Some protesters had set fire to a hastily assembled barrier at the corner of 16th Street and Telegraph, in a bid to prevent access to the occupied building, but police drove demonstrators away from 16th Street using tear gas, flashbang grenades, and non-lethal rounds. Sabehgi said he had not been in the occupied building, and was walking away from the main area of trouble when he was injured. He said he had his arms folded and was “totally peaceful” before being arrested. The recent events at Occupy Oakland have galvanized the Occupy Wall Street movement. There is definitely a new resolve among the protesters in each city, not only in America, but world-wide. 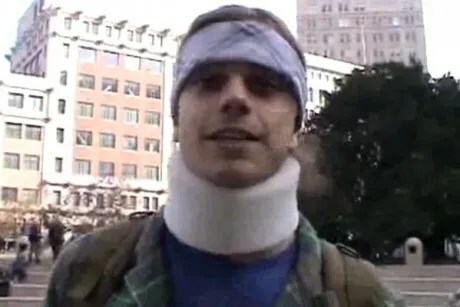 The Iraq War Veteran and Marine named Scott Olsen who was injured by police at Occupy Oakland, has quickly become the movements latest hero and rallying cry. So imagine my surprise this morning when I woke up a little late, and realized that my phone and email had been going crazy. Just what was causing all the buzz? Well…….. somewhere in the deep recesses of the Cyberspace lays a now defunct website called IHateTheMarineCorp.com . The website, which is no longer active was an anonymous forum that allowed current and former Marines to vent their grievances against the USMC with complete safety and anonymity. 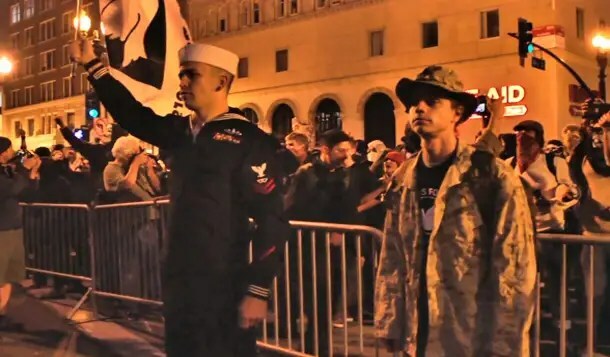 The now defunct site seems to have been founded by Scott Olson, the Marine critically injured by Oakland Police this week at Occupy Oakland and Olsen is the former registered owner of that internet domain. Apparently The Right seems to think that this is the bombshell which will extinguish the fervor behind not only Scott Olsen, but perhaps the Occupy movement itself. Scott Olsen is an American. A 24-year old Marine who served not 1 but 2 tours in Iraq. That alone makes him and thousands of Soldiers and Veterans like him MY Hero, and I Thank You For Your Service. Olson’s love of Country and what is right, does not stop there however. 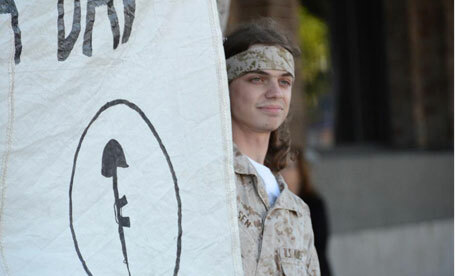 He is also a member Veterans for Peace, an organization founded in 1985. Consisting of male and female US military veterans of World War II, the Korean War, the Vietnam War, the Gulf War, Afghanistan, Iraq, and other conflicts, as well as peacetime veterans. 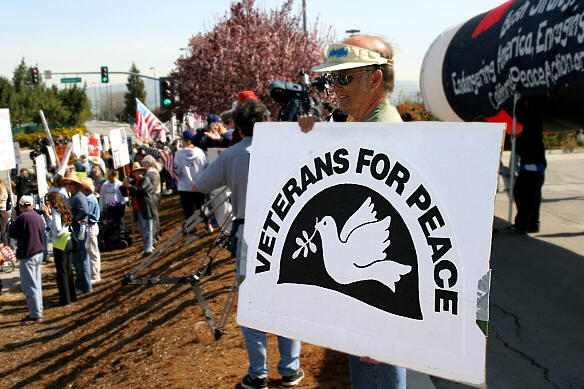 Veterans for Peace works to promote alternatives to war. But Scott Olsen’s commitment went further. He knew based on his personal experiences in the military, that War was not pleasant, that many, like him had grievances which were not addressed, and that some, if the persons identity were ever exposed, their military career could be and would be jeopardized. Thus the anonymous forum”IHateTheMarineCorp.com” was conceived and created. Scott Olsen’s foray into Anonymous Web Forums ultimately did not survive, but while researching information for this blog post, I found many websites and/or forums that were, if not directly inspired by Olsen’s efforts, at the very least they had the same general idea. As American’s we still enjoy the right to Freedom of Speech. I may not necessarily agree with someone or even have to, but I will defend their right to express themselves always. Last but certainly not least, Scott Olsen, like many of us, felt compelled to participate in the Occupy Movement. To stand up for what is right, and reject what is wrong. 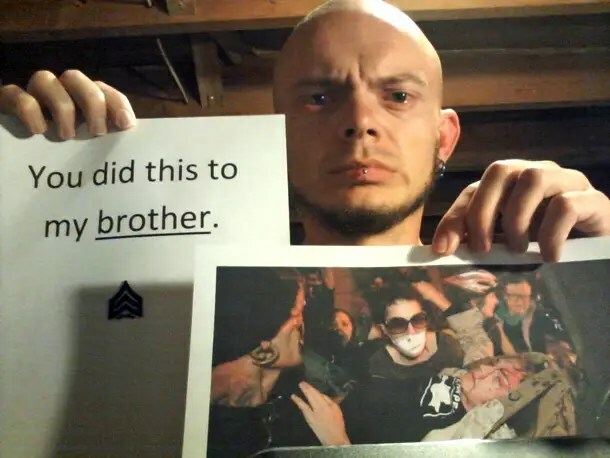 Sadly, this 2 tour Iraq war veteran, who was not injured in the conflict abroad, came home to his country to be critically injured in the growing conflict at home, by an organization that is only supposed to protect and serve the American Public. Ironically, The Right has attempted to use the culmination of this information in an effort to disparage and demonize the service and character of Scott Olsen. I have seen and read everything from him supposedly being Anti-Semitic, to being a traitor or deserter, when nothing could be further from the truth. My response to the Right is an emphatic, “Try Again”. Scott Olsen did not choose to be the latest Hero of Occupy movement and we cannot and will not allow others to choose our heroes for us. Real Heroes are never chosen. We know them when we see them, and we thank them when we meet them. Thank You Scott Olsen, for we are ALL Scott Olsen. This information was not included in the PoliticsUSA story. This additional information, does not change a thing. I look at Scott Olsen as a Hero, not by his choice, by by circumstance, and we should support him in his recovery…. again… Thank You for Your Service Scott Olsen, both here, and abroad. A protester in Oakland, Scott Olsen, was hit in the head by a police projectile in the confrontation two days ago. Olsen, an Iraq-war veteran, is in critical condition in the hospital and may die of his injuries. The following video was sent to us by the the aunt of the man who shot the footage, Raleigh Latham. Latham filmed Tuesday’s action throughout the course of the day and stood on the front lines with protesters when they confronted police. Scott Olsen is seen here on the right, moments before he suffered his head injury and those who rushed to his aid were assaulted by police. Scott Olsen remains in critical condition. Officials at Highland Hospital in Oakland are refusing comment on Olsen’s condition at this time and the media is being instructed to call back at 8:30 PDT. We will update his condition then. Marines around the world are outraged by the injuries inflicted by police on Scott Olsen at Tuesday’s Occupy Oakland protests. Olsen is in a medically-induced coma after getting hit in the head by a police projectile.